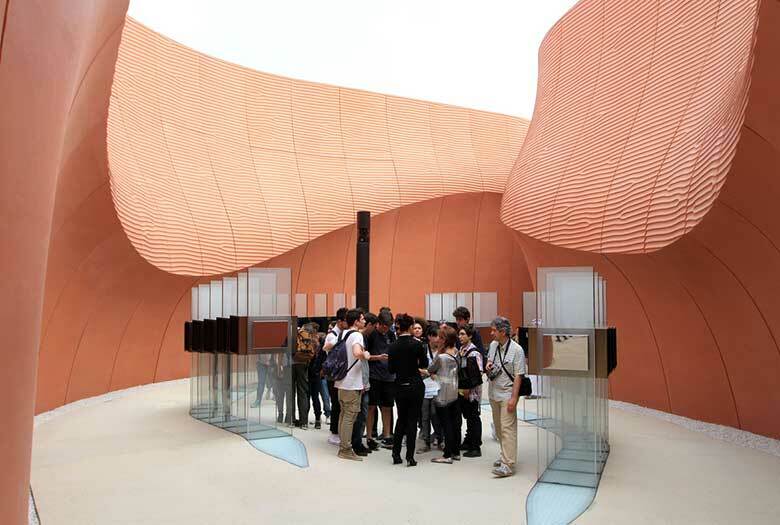 Expo Milano 2015 materials tour: mineral Brad Turner. November 16, 2015. 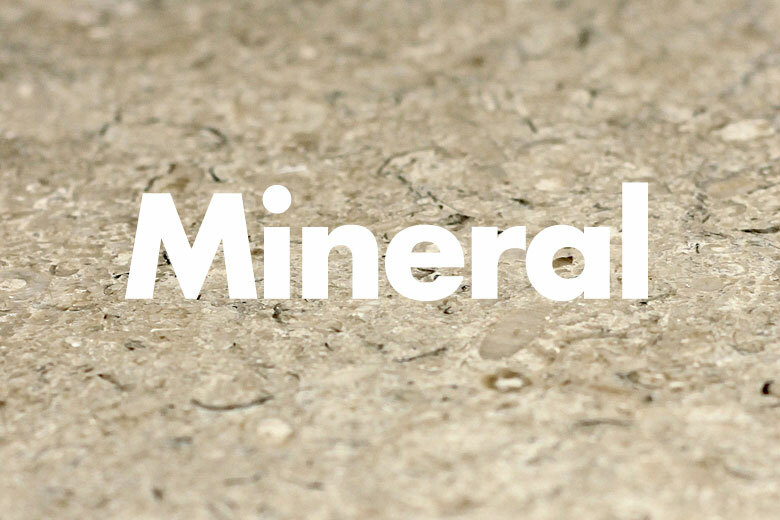 In the second of four posts we take a look at all things mineral. With design a part of their national identity, and being the host nation, all eyes were focussed on what the Italians would produce – and they didn’t hold back. 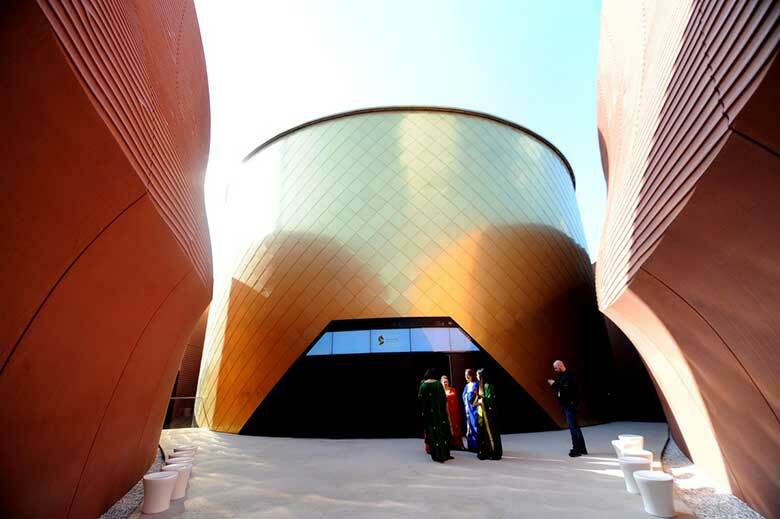 As the only piece of permanent architecture at the expo, the Italians enjoyed an increased freedom in materials, budget and design other pavilions were not afforded. 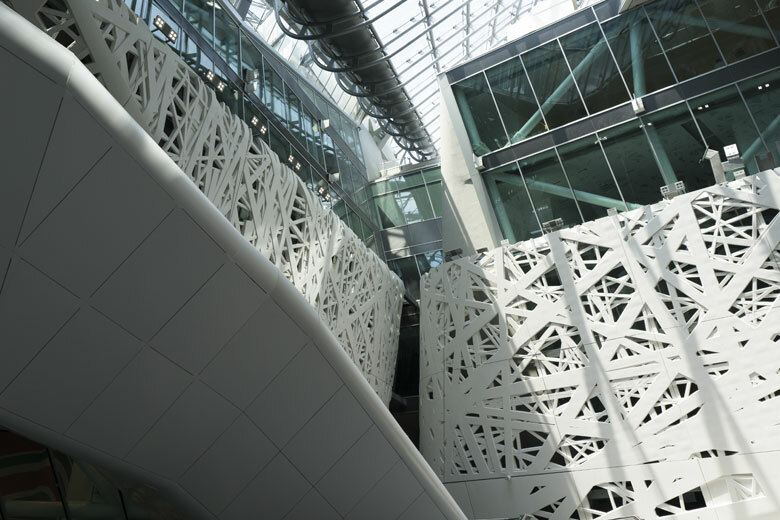 Palazzo Italia reaches a height of 35m, symbolically the highest peak within the expo. 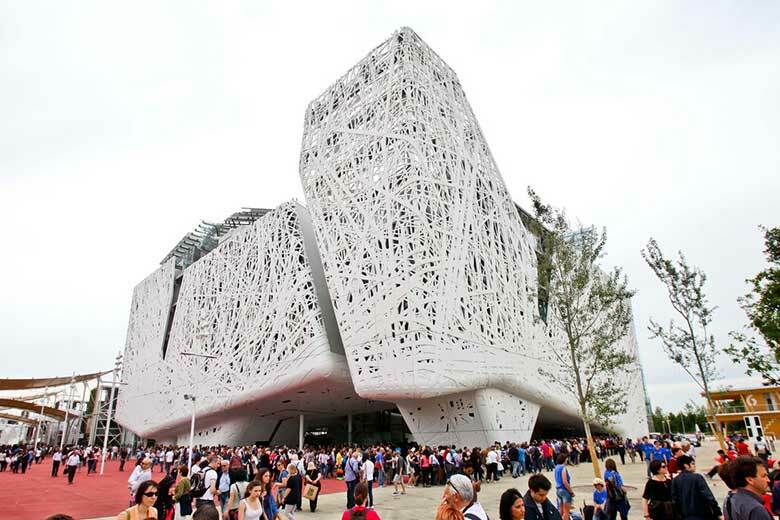 The 9000 sqm facade is clad in sparkling white pre-cast concrete elements, each panel unique and numbering over 700 individual panels in total. 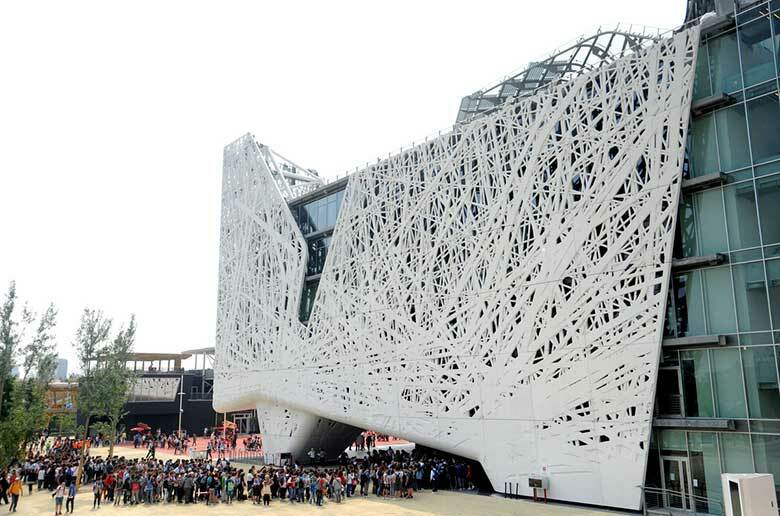 The energetic ‘branched’ motif gives the facade a lightweight and delicate appearance despite it’s massiveness. 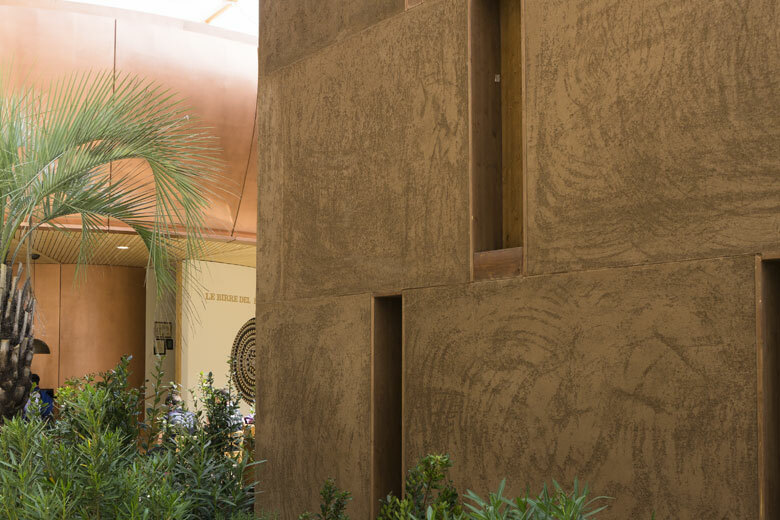 The concrete employed on the Italian pavilion is the ‘i.active Biodynamic’ concrete from Italcementi, a highly flowable mortar that gives excellent surface detail and aids the manufacture of complex forms. 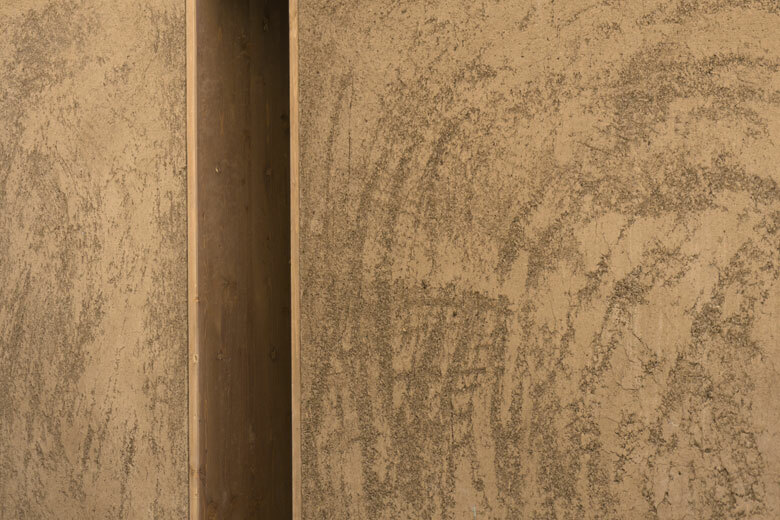 The concrete uses Italcementi’s ‘TX Active’ technology, a photocatalytic compound that breaks down organic materials and smog in the presence of UV light, giving it self-cleaning and air purifying properties. 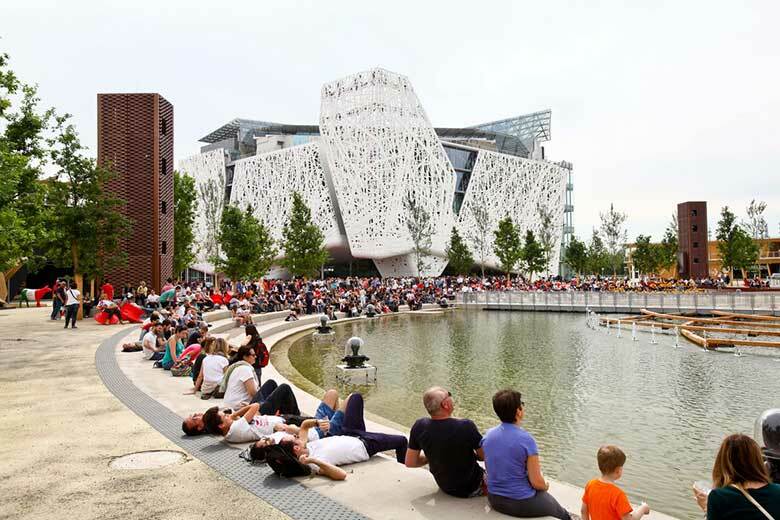 Over 2000 tons of concrete was used in the construction of the pavilion, containing 80% recycled aggregate including waste marble from Carrara quarries to give an added lustre to the fair faced white concrete. 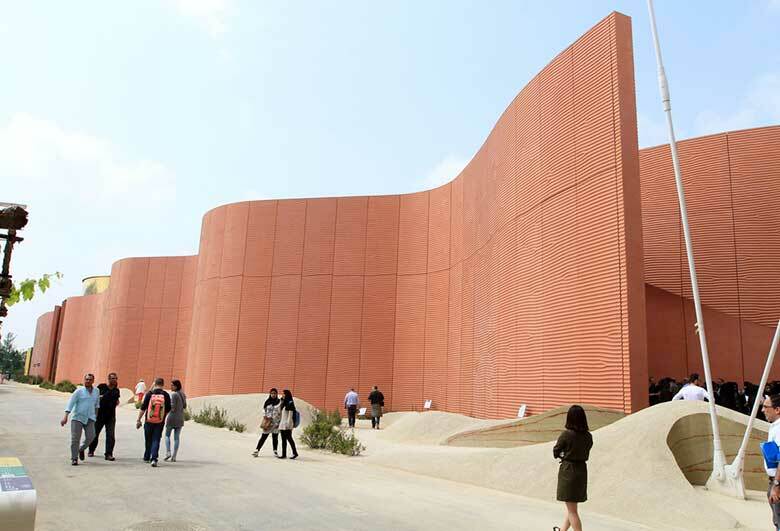 No, not the name of an obscure country that you’ve never heard of, Vanke is a corporate pavilion that receives an honourable mention in recognition of its beautiful cladding material. 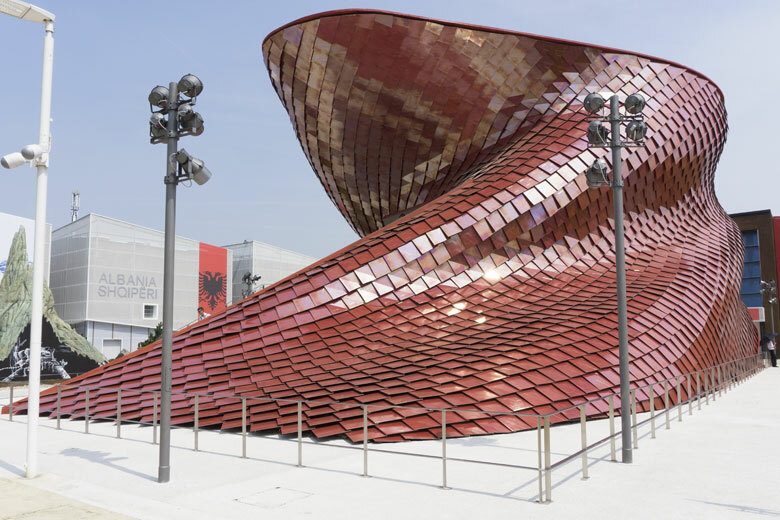 4200 three dimensional porcelain stoneware tiles, layered by architects Daniel Libeskind, produced the effect of reptilian scales. The tiles, 60x60cm modules with an embossed pattern, were fixed back to a steel structure. 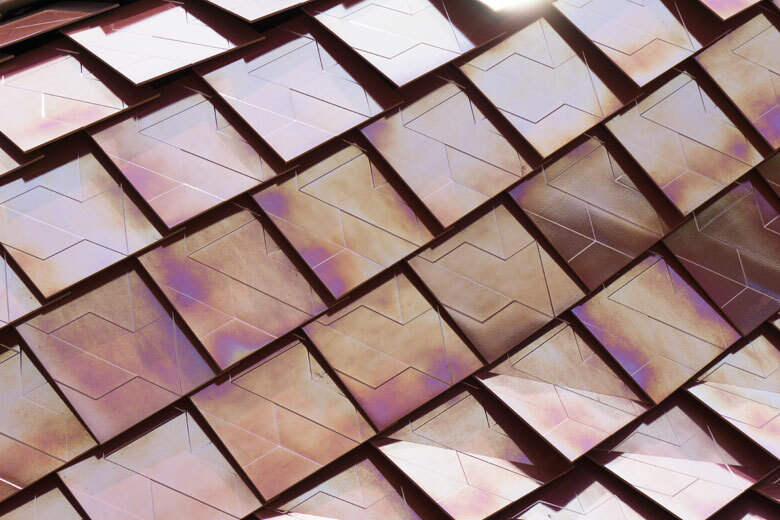 The real magic of the Vanke pavilion was in the colour-changing iridescent finish that the tiles possess, designed by Libeskind with Italian ceramicists Casalgrande Padana. The continually changing, facetted form, combined with the dichroic colouring, created stunning variation in appearance and a real dynamism. This colour-changing effect was achieved through the application of a specially developed glaze, saturated with metallic oxides, fired at high temperatures of 1250°C and fused to the ceramic surface. Foster and Partners’ United Arab Emirates pavilion stood in defiance of sensible practice for the construction of temporary pavilions. 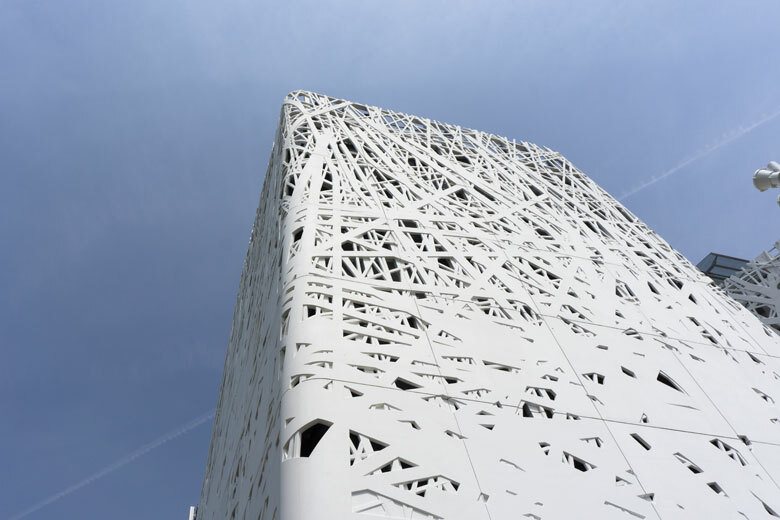 It was primarily composed of demountable glass-reinforced concrete (GRC) panels attached to a steel frame. 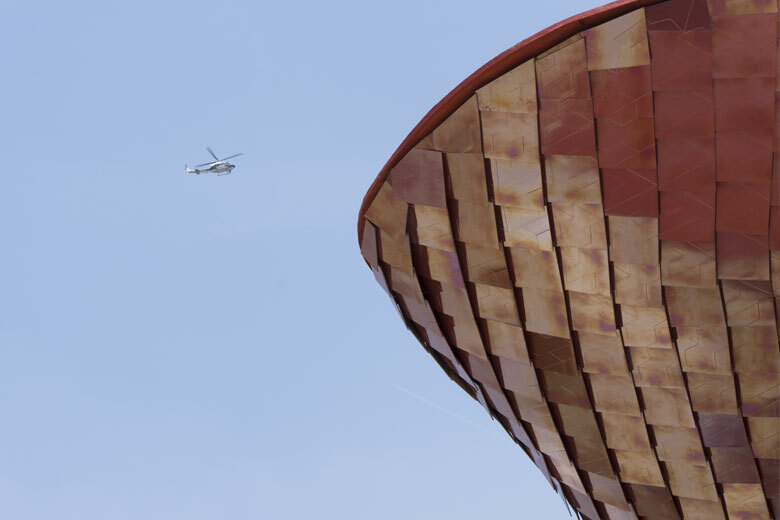 The rationale for these huge, expensive GRC panels (some up to 12m tall), as with some of the other more extravagant pavilions, is that they are designed to last and be reused. The eventual intention being that the pavilion will be disassembled and relocated to a site within the UAE following the expo. 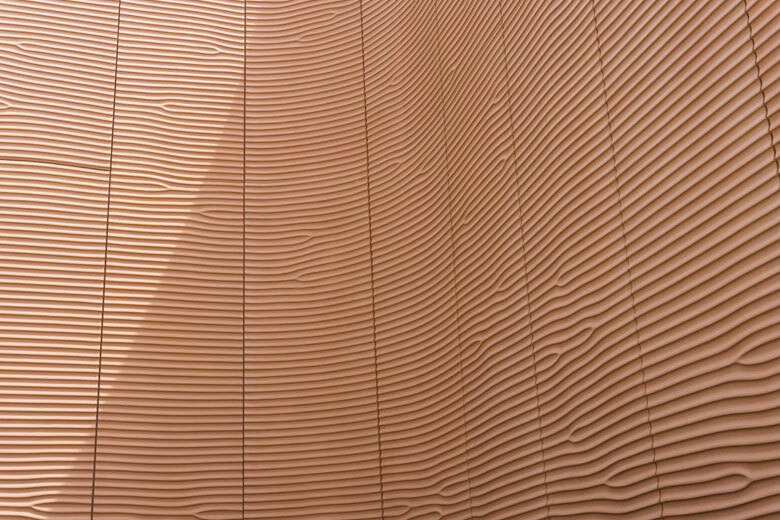 The panels have a cast surface texture, representing patterns found within sand dunes. Few panels repeat, if any, leading to more complex production requirements and a more costly process than a repeating modular system. 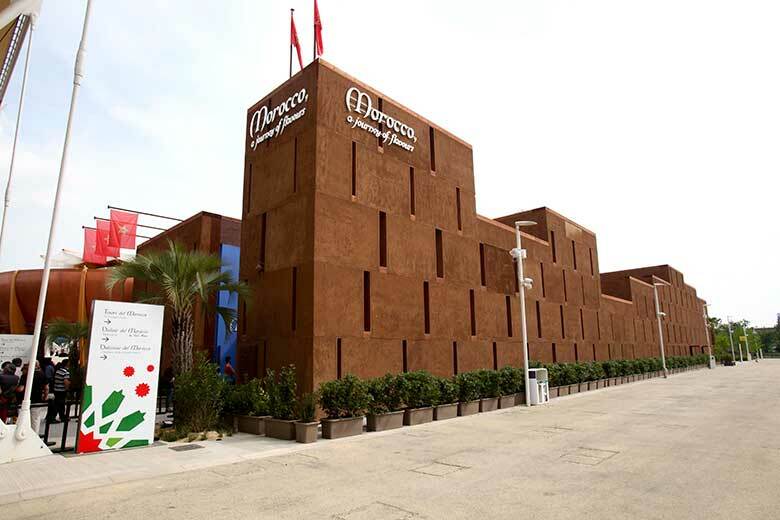 The pavilion of Morocco used a contemporary reinterpretation of traditional earthen structures and construction techniques. Adobe was placed within large pre-fabricated wooden panels, compacted and then mounted onto a steel frame. This method adapts the use of traditional materials to industrialised construction methods more appropriate for a temporary structure and modern construction schedules. At the end of the expo, the panels will be dismantled and re-used. 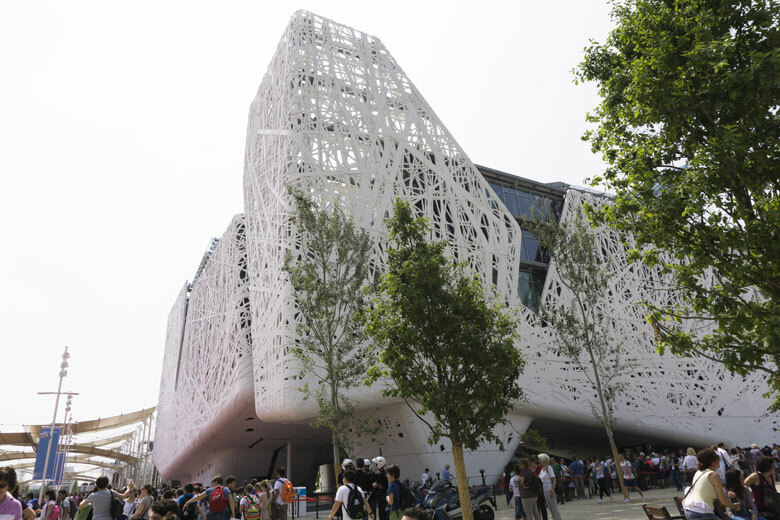 Join us next week as we continue our whistle-stop tour of Milan Expo 2015. Next up: wood.